GOD! THIS *IS* A TASTY LITTLE SUCKER! I think yinz understand the concept. It’s another good idea we’ve borrowed from our Muslim friends, such as algebra and observing objects in the sky with telescopes to draw rational conclusions about the universe. Ramadan. Zappadan. Both really really long observances. But with Zappadan, no fasting! In fact, one has unlimited license during this time to heat up yer stovetop, burn a weenie to a crisp, and slap it onto a slice of bread. That kitchen of yours may be dangerous. For me, Zappadan has traditionally provided a creative spark and a fantastic opportunity to mull in the Zappa. I have spent Zappadans in reporting mode, finding tidbits from the Miles biography to share. I have spent them in music appreciation mode, absorbing The Yellow Shark one year, and simply focusing on the Mothers era yet another. Zappadan began as a mere blogswarm. I think for many a fan, myself included, it has become a genuine installation of the holiday season. Thanksgiving. Zappadan. Hanukah. Kwanza. Christmas. Festivus. So let me begin this year by saying this: I love Frank Zappa. I am a second-generation freak. My Dad was introduced to an album called Freak Out by a roommate. My Dad in turn played me the song “Who Are The Brain Police” when I was 3. 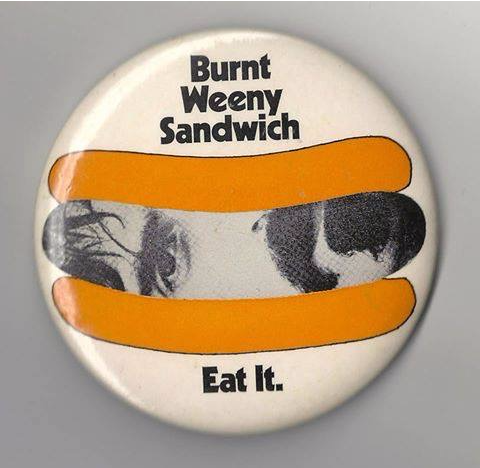 But it was on a bus trip back home for the holidays that I really came to love Frank Zappa with a little thing called Burnt Weeny Sandwich. Have you heard this thing? It is glorious. So several years ago, I became aware of this thing called “Zappadan.” And it has only grown and swelled until it is a TASTY LITTLE SUCKER. I see actual RADIO STATIONS observing the Zappadan. We see Zappadan generally celebrated outside of the grander blogosphere. Pretty nice for a one-time cute little blogswarm. But hey. Enough of my yackin’! What’dya say? Let’s boogie! This entry was posted in Zappadan 2017 by Aaron B. Pryor. Bookmark the permalink.